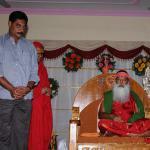 Gandigunta – Sri Anagha Devi Sametha Datta Digambara Kshetram witnessed its 18th anniversary with much fanfare. Ksheera Abhishekam and Annadanam were performed. HH Sri Ganapathi Sachchidananda Swamiji inaugurated the first floor Hall in Anagha Lakshmi Sadanam. 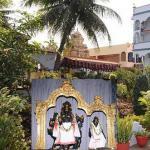 Sri Swamiji named it Sobhanadri Hall, after the name of the main donor Sri Vadde Sobhanadreeswara Rao. (He is a former agriculture minister and philanthropist). Sri Chakra Puja was performed in the new Hall. In the evening, Sri Kirit Patel of Baton Rouge was honoured. MLC Sri Rajendra Prasad Yalamanchili visited. Devotees vowed to complete the construction of the Community hall by fully furnishing it and providing all required amenities including air conditioning. Matru Mandali arranged Dolotsavam to Sadguru Deva. 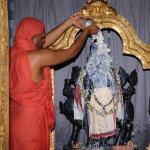 In His message to TV Channels, Sri Swamiji wished that Devotees live peacefully without getting disturbed. When referred to an incident, when a small pig is making round around a temple for the past few weeks, Sri Swamiji pointed towards the Samskara (Remembrance about previous births and resultant effects on the minds) of all creatures. He drew the attention of public to various stories in Mythology, where each being experiences various stages of enlightenment during many cycles of life. People may think it is all fantasy. But, God causes such incidents to prove the point. Bhagavad Geeta says, that there is no reason for worry for a Saadhaka (seeker indulging in Spiritual Practice) even if he/ she dies amidst his practice. The state of consciousness continues in the next birth, He explained.